It is common practice, in the sphere of art criticism, that when art critics analyze the idea of homosexuality in paintings, they strive to establish a fixed place and meaning for the various elements or objects they see in a painting, and force onto the reader that this metaphor here or that symbol there has this meaning or sense. They tirelessly seek these elements inside the work to state that, for example, this tree here has a hidden meaning and is representing something besides what it is. Therefore, in a work that is full of vitality, a serious work of art, we are dealing with different layers of forces set in motion, on the canvas, by the person who created the work. However, the metaphors that are discovered by critics refer solely to something else, neglecting the assemblage of forces of a Deleuzian nature, and this fixity in the use of metaphors does damage to the actual work. This is because a piece of art, a genuinely profound work in which the viewer is absorbed, is, before anything else, an assemblage of different forces working inside the work – forces related to the intensity of the life present in the work. The critical approach that assumes that elements in the work of art stand for others raises the whole problematic of “Representation”, of one thing representing another. Representation deals with a piece of art as an assemblage of the forces concerned with the idea of art work as an “Event”, and the “Event” is what is taken for the real confronting us. The real is not something clearly laid down in front of us, but is composed of the forces that go beyond any distinct definition of them; it is the intensity of forces that have already broken down the boundaries of the Representation of the “Reality” we perceive and know with our eyes. To deal with metaphor is therefore to deal with the whole package of “Representation”, the idea that we replace something for something else, and therefore things do not necessarily correspond to how they initially appear in a work. An eagle depicted in a painting stands as a metaphor, as well as what it is simply: an eagle. It acquires a meaning that it has been attached, iconically. The work of art is already wrapped in layers of fixed metaphors in order to signify a meaning. And that is the reason, in works that are truly works of art, behind the idea of Representation. For example, in a master work by a great artist like Velasquez a serious viewer can easily see how the work composes exactly what Deleuze calls an “Assemblage”, because all the elements in the painting, all the objects bring about that “Intensity” we already mentioned, an amazing array of forces that have such vital power in them; the different characters, the king and queen at the far right of the canvas, looking at us, the spectators, to the far left, the painter himself, they all extend the power that concerns only artists, and that is the idea of metamorphoses, rather than the plane fixity of metaphor. This means that in a serious work of art, in a work like Velasquez’s “Las Meninas”, we are seeing the act of metaphors creating sense that dismantles, by itself, the fixed correspondences of the Representational approach. Every element creates a series of unstable metaphors that keep metamorphosing, and becoming something else and contributing to an infinity of new forces! This is exactly what we mean by breaking the hegemony of Representation in the work of art critics that only seek to identify which object stands for what meaning. Thus, this whole machinery of metaphor tries to create meaning in the work, one metaphor at a time, but no fixity may be derived from aligning the assemblage of the different forces already mentioned. The best example of seeing how this idea of the metamorphosis of metaphors works, constantly opening these fixed metaphors into the space of the infinity of no fixed meaning, is the way Michel Foucault writes pages upon pages about “Las Meninas” by the great painter, Velasquez. In this beautifully condensed approach to the idea of Representation, and its viscous allies “metaphor”, he shows in minute detail how a great artist can free his work from being trapped in the fixity of metaphor. 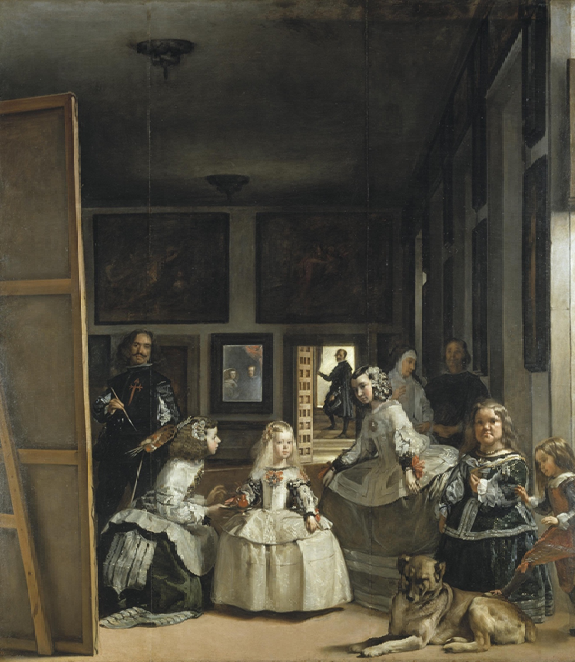 Writing on “Las Meninas”, Foucault beautifully points to this idea when he observes how Velasquez plays with the idea of the metamorphosis of metaphors, arranging them in a series of changes that destabilize the fixity of meaning of the work: “And here the great canvas with its back to us on the extreme left of the picture exercises its second function: stubbornly invisible, it prevents the relation of these gazes from ever being discoverable or definitely established. The opaque fixity that it establishes on one side renders forever unstable the play of metamorphoses established in the center between spectator and model” (Foucault, The Order of Things 4). Here the world of signs, symbols and metaphors, with all their different names, help to distract from the real forces at work within the painting, and are the tools of a systematic “Representation” that contributes to making these array of forces within the work of art, and in our examination of it, locked in a fixed point of no return, and the painting loses all of its vitality. If one is trying to work with metaphors, symbols, and signs, one has to open them up to a play of infinity, as Foucault says, and this will prevent the work of these metaphors and symbols of “ever being discoverable or definitely established”. And here is the whole idea of knowing what metaphors are doing in a given text. We have to use ways of dealing with them in order to prevent the traditional fixity of meaning and sense stultifying a work of art. As Foucault explained with regard to “Las Meninas”, the painting brings together all those elements and objects on a canvas, but prevents the work from falling into an array of metaphors signaling this or that particular place of meaning, and instead opens them up to a marvelous play of metamorphosis that endows them with an infinity of meanings and sense. The painting gives the viewer the opportunity to encounter the true forces of the life of the work, by opening it up to the immensity of the “Real’, to the “Event” of art encountering life in its fullness, and dealing with the “Real” not as if it were a package of metaphors representing life void of vitality. Art is always an encounter with the new, with an infinite movement of what has not been said before. It is the encounter with the radically new. That is why we have to be very careful to avoid doing what certain art critics do, finding fixed meaning for what is truly, radically different and chaotic and unstable, such as life itself. Sara Vakili is a Ph.D candidate in English Department at University of Tuebingen in Germany. Her project is on “Making of an Icon; Saint Sebastian and Rumi in Queer Culture”. She received her Master in Art from the same university focusing on “The Role of Metaphor in Robert Rauschenberg’s and Jasper Johns’ Paintings”. Prior to that, she studied Fine Arts at San Francisco State University, California. She was nominated for the 19th Annual Stillwell Student Show Award.